LeFunk! is a highly acclaimed classic dancefloor covers band based in Manchester. 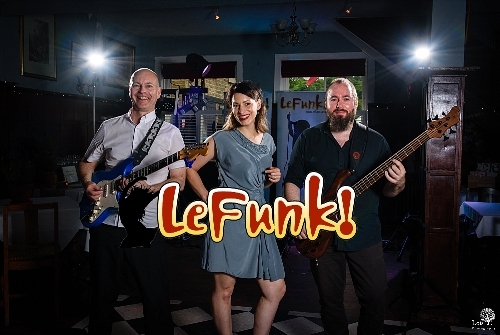 If you are looking to bring a fun, party atmosphere to an event, be it a wedding, birthday, festival or conference, then LeFunk! could be the perfect choice. The band is available in three formats, the 5 piece, 4 piece or a compact trio, making LeFunk! the perfect choice for venue sizes ranging from the corner of a bar to large hotels and concert halls! We can also provide additional live classical piano or solo vocal performances as background music during the earlier phases of an event, and an acoustic duo option. Talented multi instrumentalist and Royal Northern College of Music (drums/percussion) graduate Benn has played many venues around the UK with bands of all styles such as ‘Music Live’ at The Birmingham National Exhibition Centre, Manchester Academy, Manchester Club Academy and The RNCM. In keeping with his love of 60s and 70s soul music, Benn was the first drummer to play with a live band inside the legendary Twisted Wheel soul club in Manchester since closure in 1971, the previous band being The Spencer Davis Group! Dean has been playing bass for around 30 years, mostly working in a song-writing/recording partnership but also co-founding and playing for years with the popular Birmingham-based 60s cover band Tobacco Road. Paul is a classically trained multi instrumentalist and a graduate of Salford University with a BA Hons 1st degree in Popular Music. Paul has been teaching music and working on the session, deputy and function scene relentlessly for the past 15 years and this work has led him to perform with musicians from the New York River dance production as well as various past and present chart topping pop artists and music industry song writing teams. Classically trained and a graduate of Salford University (Popular Music and Recording) Anna is constantly in demand for live work with bands in the Manchester area and also gives regular church/recitals and tuition. Venues she's performed at include many Irish Centres such as Leeds, Huddersfield, Middlesborough, and Corby; and other prestigious venues for example the Longfield Suite at Prestwich and Wolverhampton Racecourse. She has also played at indie venues such as the Roadhouse, Club Academy, Ruby Lounge, and Night and Day, all well known in the Manchester area. Dave has been playing guitar since he and Dean formed their first group as teenagers. He founded and performed with various university and function bands in Birmingham in the 80s, playing at major hotels including the National Exhibition Centre Metrapole and university balls. A versatile guitarist with a love of many genres, he has played in Jazz and Jazz Funk bands at Alexander’s Jazz Theatre, Cinnamon Club, Iguana Bar and various other Manchester venues, and has spent the last few years studying classical guitar to progress through the full syllabus of ABRSM Classical guitar exams. Laura-Jayne trained in voice and performing arts at Manchester's Capitol Theatre before fronting indie-pop outfit Mia and covers band The Sun Band. Over the last few years she has been inundated with demand for her solo act 'Indie Lounge', comprising alternative chilled down versions of popular songs of all genres. Her versatile vocals have led to many varied bookings throughout her career at venues including Peckforton Castle, Band on the Wall, the Free Trade Hall and Manchester's Comedy Store (as a singer, not comedian! ), along with countless function rooms at hotels up and down the country. Singing professionally in Ireland for over 8 years Jade performed for over 5000 people with Chris De Burg, Shane McGowan and Meatloaf at the INEC and has gigged with popular Irish Indie band the Coronas. She's played more weddings, clubs and pubs than she can remember all over Ireland both as part of a function band and in tributes to Abba, Blondie, Dolly Parton and Cher. Laura joined the band in Autumn 2010 and was LeFunk's lead vocalist until January 2014. A gifted and totally natural singer with a great range allowing the band to perform a wide ranging repertoire, Laura continues to provide the band with back up as a deputy singer for emergencies. Multi-roomed traditional pub with food service. It is far bigger than it first appears - in total there are six separate rooms. A central bar serves all the rooms, with the small Martingale Room available upstairs for functions. Featuring the full 5 piece band.